Sign up for free and just shop with Blacks as normal. Our average member earns over £300 cashback a year. Blacks cashback can be earned simply by clicking through to the merchant and shopping as normal. Blacks Cashback is available through TopCashback on genuine, tracked transactions completed immediately and wholly online. Please note that cashback from this merchant is calculated on the purchase price excluding VAT or any other taxes and delivery charges. 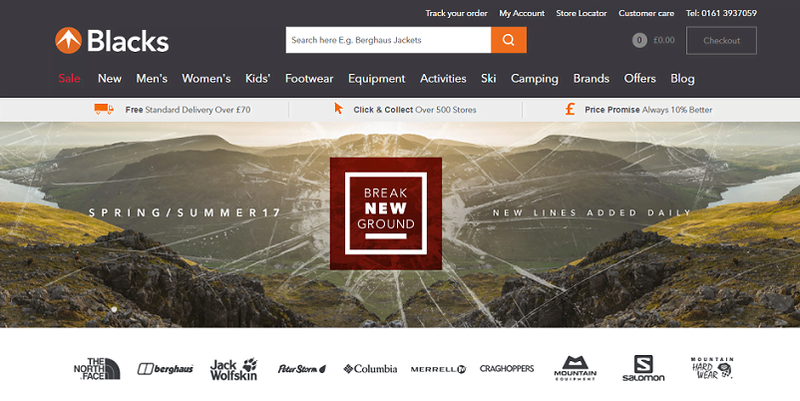 Shop for outdoor clothing and equipment by leading brands like The North Face, Mountain Equipment, Jack Wolfskin and Berghaus, and save money with our Blacks voucher code and cashback deals. They sell a huge range of footwear and accessories for camping, cycling, hiking, running, walking or any other adventure, including sleeping bags, bikes, navigation aids like maps, survival shelters and rucksacks, whether you are planning a weekend trip or holiday. If you are going to a festival or need something for when you travel or play sports, the Blacks outdoor clothing range also includes waterproof jackets, cycle helmets and watches. Browse their offers and sale categories for great discounts on everything from walking guides and camp beds to water purifiers which will improve your health. When buying the best in outdoor clothing and equipment, you can be sure you are getting a great deal thanks to the Blacks price promise. In the event of them missing a cheaper price offered by one of their competitors, they will either beat it by 10% or refund the difference plus 10% should you find the same product being sold for less elsewhere. This price promise is valid up until seven days after making a purchase. All you will need to do is provide them with the details of the product, where it is being offered at a lower price and what that price is. The competitor's product must be new and identical in style, specification, size and colour, while also be being offered on the same terms. Also, the competitor store or website must have the product in stock and available for immediate purchase or delivery. Other terms and conditions, which can be viewed on the Blacks website, apply. Shop at Blacks on the go, whenever and wherever you are, by downloading their app on your iOS or Android device. The app provides you with the easiest way to purchase all of your outdoor essentials and allows you to navigate around their online range on your handheld device, making it easy to buy exactly what you want. If you need to visit a shop, the app will help you find the nearest one to you thanks to its store finder section. If you are just browsing or thinking of present ideas which people can buy you for a special occasion, the app will allow you to create a wishlist and constantly add items to it whenever you see something you like. Whatever you buy using our Blacks discount code and cashback deals, they offer a range of delivery and collection options to suit you. Spend over £70 in a single transaction and you can benefit from free standard delivery. With this service, your item will arrive within five working days, while they deliver seven days a week between 8am and 8pm. You will also be able to track your item once it has left their warehouse. As an alternative to home delivery, you can choose to order online and have your item sent to a Blacks store or more than 500 alternative collection points throughout the UK for you to pick up at your convenience. This is free on orders of £70 or more and, during checkout, you can find collection points by entering your postcode, town or city. Choose this method and your item will be ready for collection within five days, but they will notify you by email when you can pick it up. If you provide your mobile phone number when placing your order, you can also receive a text message. When you collect your order, you will need to take along your confirmation email, sales receipt or text message, as well as a form of ID. You can return an item for a refund or exchange within 28 days of delivery or collection. You must tell them if you want to return an item within 14 days of receiving it, after which you will have another 14 days to do so by completing the enclosed returns form and sending it back with your item. Items must be returned in a resalable condition and in the original packaging, unless they are faulty. Items can only be exchanged in store, while if you do not return to a store, you will only be offered a refund. You can return items via a store and staff will send them back to the distribution centre free of charge. Delivery charges will be refunded for faulty goods, while if an entire order is cancelled within the 14-day period, you will also be refunded the standard delivery charge - even if you upgraded to another delivery method. Online purchases can be returned to any Blacks, Millets or Ultimate Outdoors store by taking them, together with the dispatch note or receipt, and your debit or credit card if you used this method to pay. You can also return via a Collect+ drop-off point if your parcel weighs no more than 10kg and does not exceed the maximum dimensions of 60cm x 50cm x 50cm, though you will need to create a returns label on the Collect+ website. Items can be sent back by post, though it is recommended you obtain proof of postage if choosing this method. Stay in the black when shopping for outdoor clothing and equipment with these cashback offers. Blacks sell a huge range of outdoor clothing, footwear and accessories for men, women and children, as well as walking boots and running shoes, tents and camping equipment and trail running and hiking essentials. Buy big brands like The North Face, Craghoppers, Berghaus and Sherpa and earn great rewards.